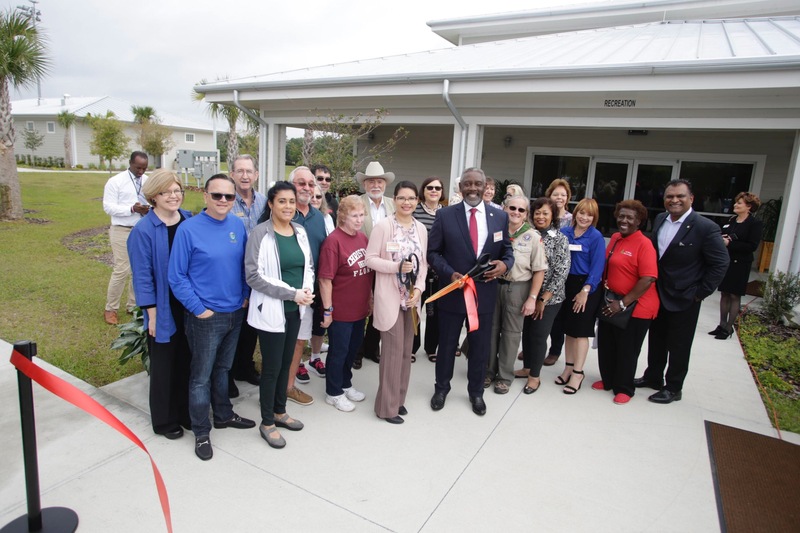 Orange County Parks and Recreation held its ribbon cutting ceremony for the East Orange District Park Recreation Center on April 2, 2019. Located in East Orange County, the park improvement project has transformed 14.4 acres into new recreational amenities for the community. The new addition includes two multi-purpose fields with LED lighting, a concession building with restrooms, a new community center with office space and additional parking spaces for guests. Orange County Mayor Jerry L. Demings provided the keynote remarks along with District 4 County Commissioner Maribel Gomez Cordero, District 5 County Commissioner Emily Bonilla and Orange County Parks and Recreation Advisory Board member Bobby Beagles. The East Orange District Park was originally part of Christmas Creek Preserve, which was purchased by the County in 1999. In 2001, the Preserve land was divided, with 243 acres transferred to the Parks and Recreation Division for the new park. “We are grateful to have beautiful space like this where we can have our youth develop their sports skills on these new fields and share time with family and friends at special events and programs in the new recreation center,” Commissioner Bonilla said. The budget for the park design and construction improvements was estimated at $4.8 million. Funding came from a combination of Orange County Park Impact Fees and two grants from the Florida Department of Economic Opportunity and the Florida Department of Environmental Protection. The remaining 890-acre preserve lies just northeast of this park and has 5.6 miles of trails which connects to the East Orange District Park. Orange County Parks and Recreation has more than 100 parks, trails and facilities and maintains 15,000-plus acres of property. Programs and special events are offered for youth, adults and seniors throughout the year. For more information, visit www.ocfl.net/parks.